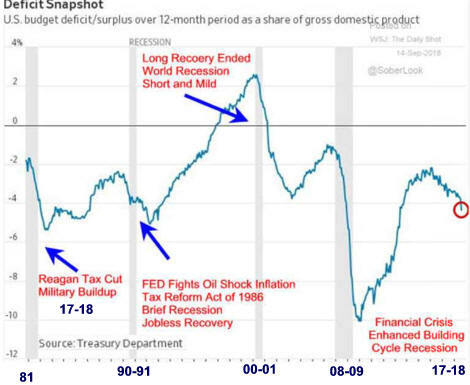 counter cyclical especially in recession. a. A balanced budget is not important. c. Money can be printed and taxes increased. 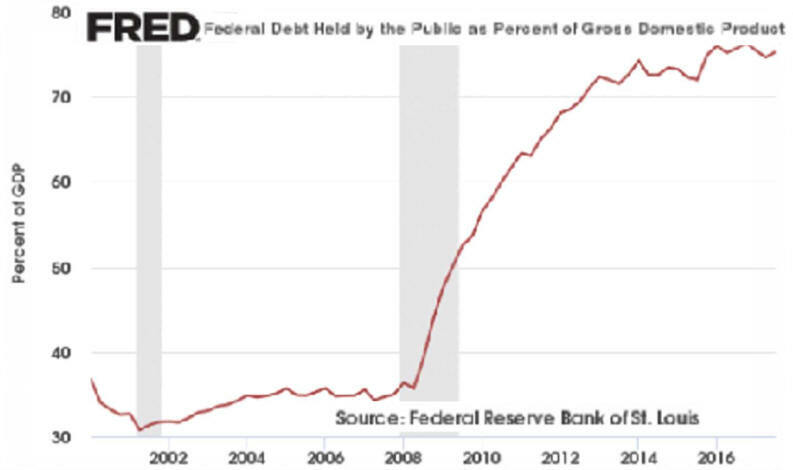 d. The interest burden of the debt is falling. activity has brought spending back to normal. See Financial Crisis Lessons ... It's extensive. to GDP to Pre-Recession Levels? 1. 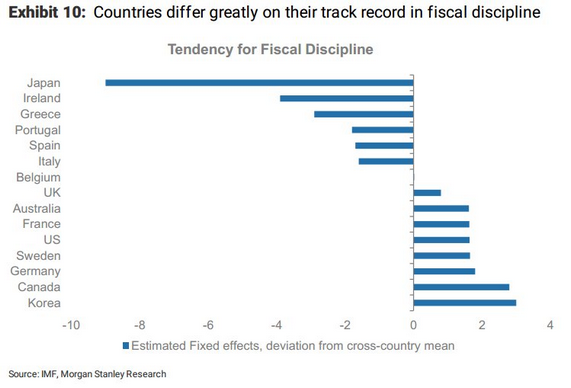 Will Inflation/Growth Slow Deficit Growth? 2. Will Debt Bring Down U.S. Capitalism? 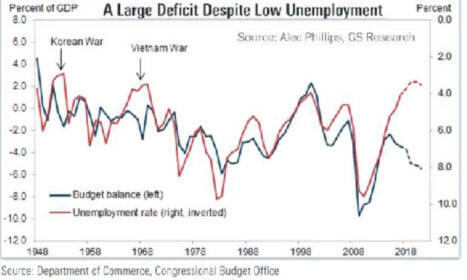 WW2 Deficits Piled Up Increasing Debt But Growth Helped! 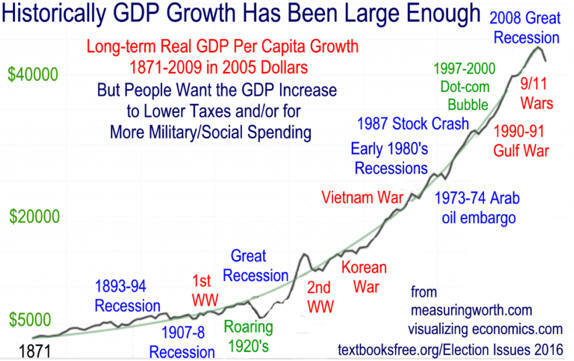 Debt breached 100 percent of GDP because of World War II and then returned to normal. 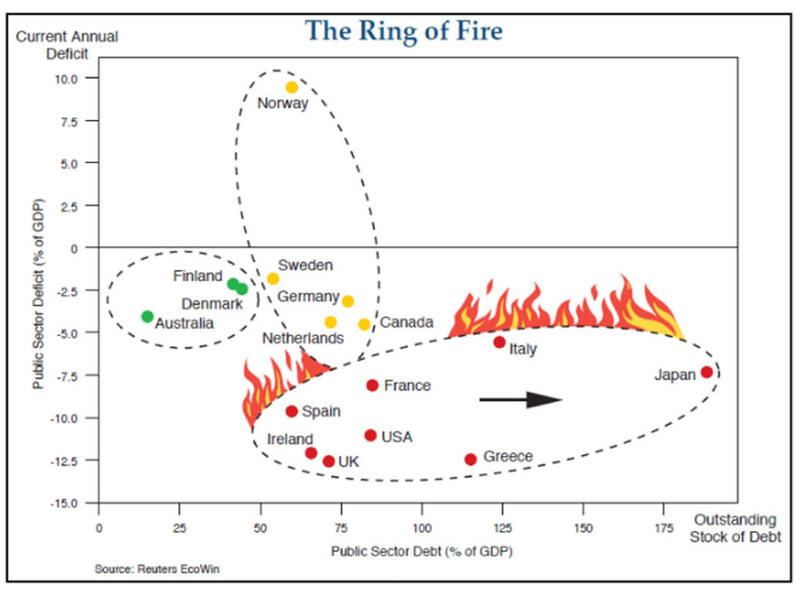 The Crash of 2008 caused a big spike but much debt was intergovernmental with no interest. because inflation risk increases with time. 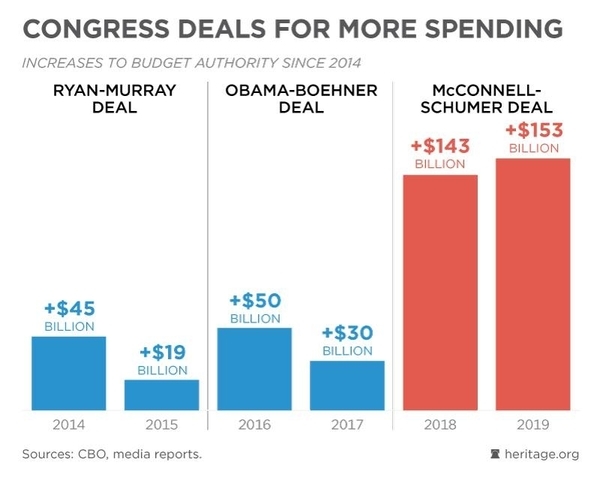 interest paid on the federal debt. bonds pushing their rate down. 2. Low mortgage lowers the risk of recession. explores running government as business. 1. Dot com bubble begins the decade. 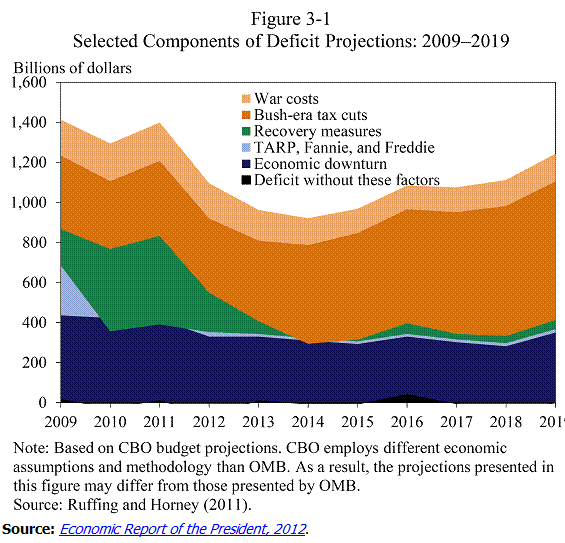 payment keeps growth high, deficit reasonable. Deep-Do-Do or D3 for mathematicians. 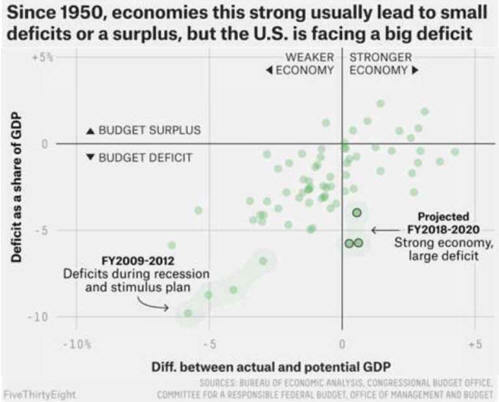 read for understanding why some are not bothered by U.S.
less than 20 percent of GDP. World War I creating a New Normal. Debt went above 70 percent in the depths of the Great Depression then returned to normal. 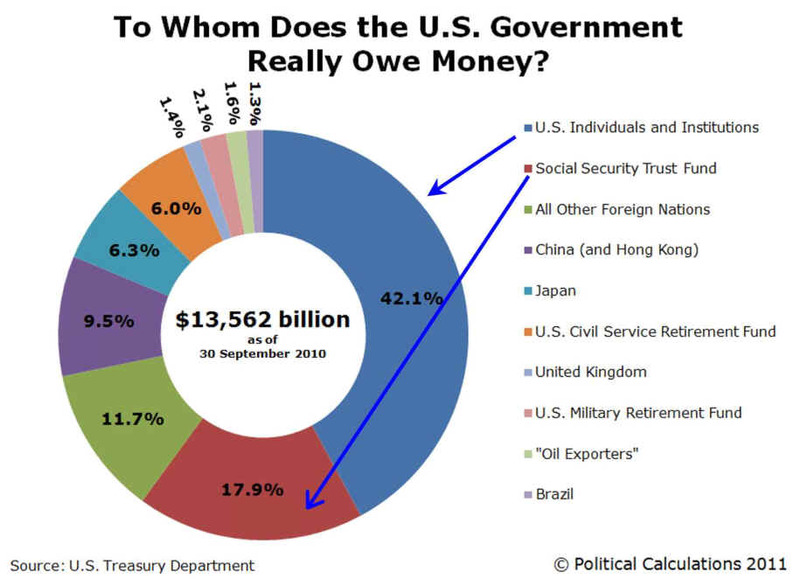 The largest single institution holding U.S. government-issued debt is Social Security's Old Age and Survivors Insurance Trust Fund, which is considered to be an "Intragovernmental" holder of the U.S. national debt, and which holds 13.9% of the nation's total public debt outstanding. 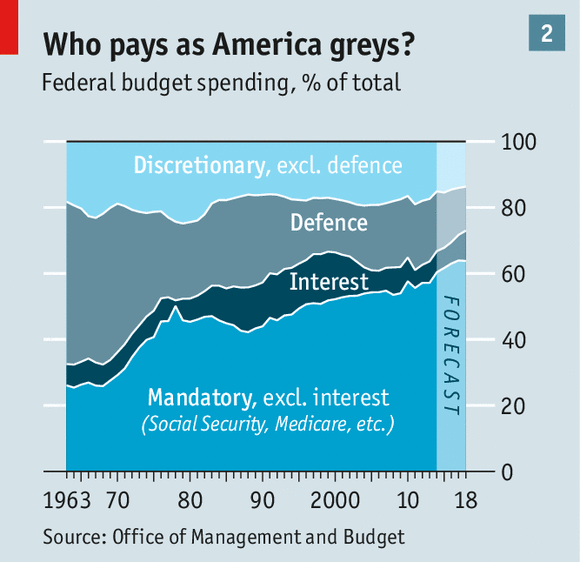 The share of the national debt held by Social Security's main trust fund is expected to fall as that government agency cashes out its holdings to pay promised levels of Social Security benefits, where its account is expected to be fully depleted in just 17 years. 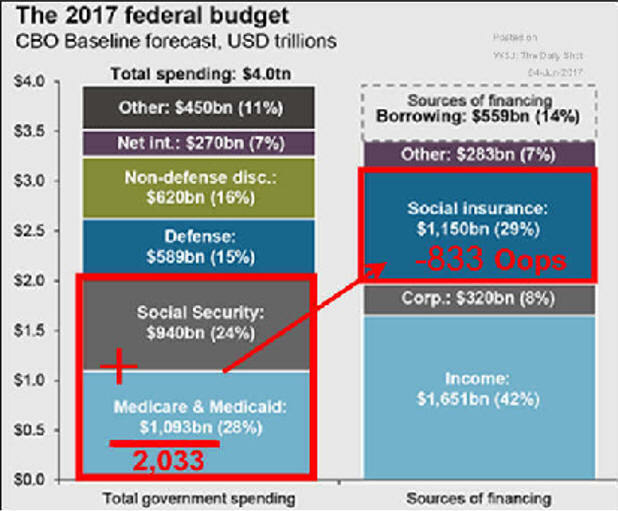 Under current law, after Social Security's trust fund runs out of money in 2034, all Social Security benefits would be reduced by 23% according to the agency's projections. 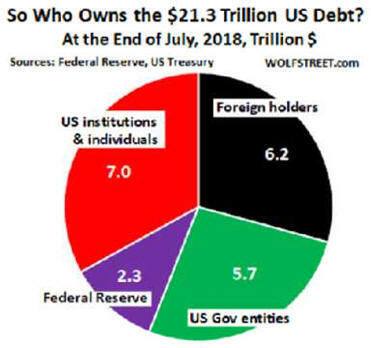 The largest "private" institution that has loaned money to the U.S. government is the U.S. Federal Reserve, which accounts for nearly one out of every eight dollars borrowed by the U.S. government. 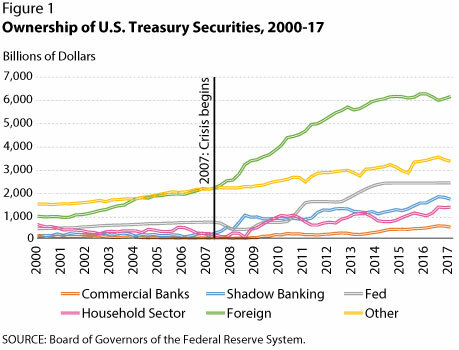 It lent nearly all of that total since 2008, mainly through the various quantitative easing programs it operated from 2009 through 2015 in its attempt to stimulate the U.S. economy enough to keep it from falling back into recession. 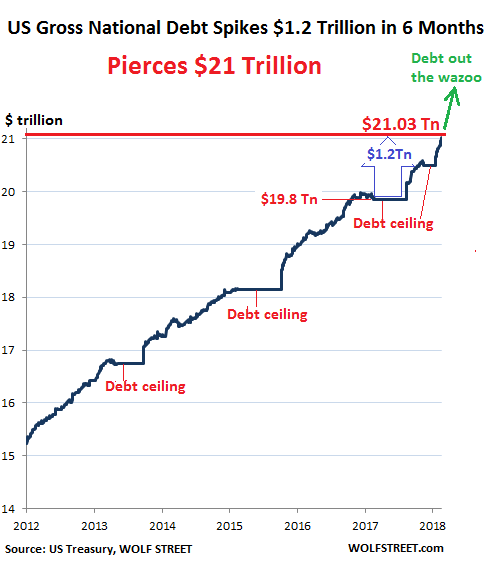 In September 2017, the Fed announced that it would begin reducing its holdings of U.S. government-issued debt. 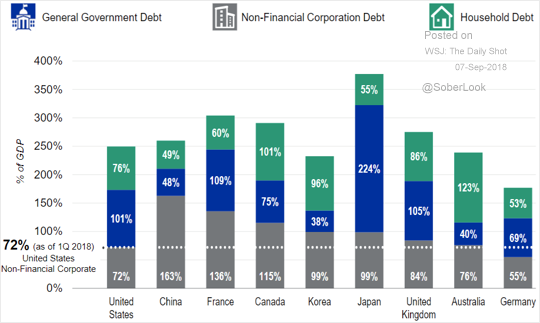 Overall, 69% of the U.S. government's total public debt outstanding is held by U.S. individuals and institutions, while 31% is held by foreign entities. 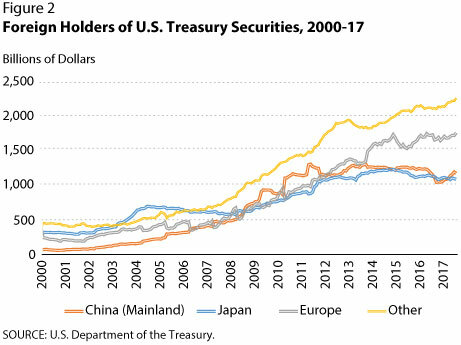 China has resumed its position as the top foreign holder of U.S. government-issued debt, with directly accounting for 6.9% between institutions on the Chinese mainland and Hong Kong. Source has much information by year. 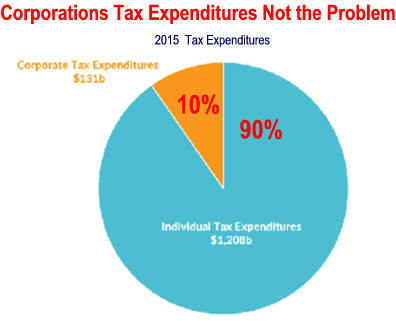 have a substantial affect what is paid by tax entities. 1986 because they hide political maneuvering from all but experts. Editors Note: Because federal assets are not accounted for there is no way to calculate federal worth. 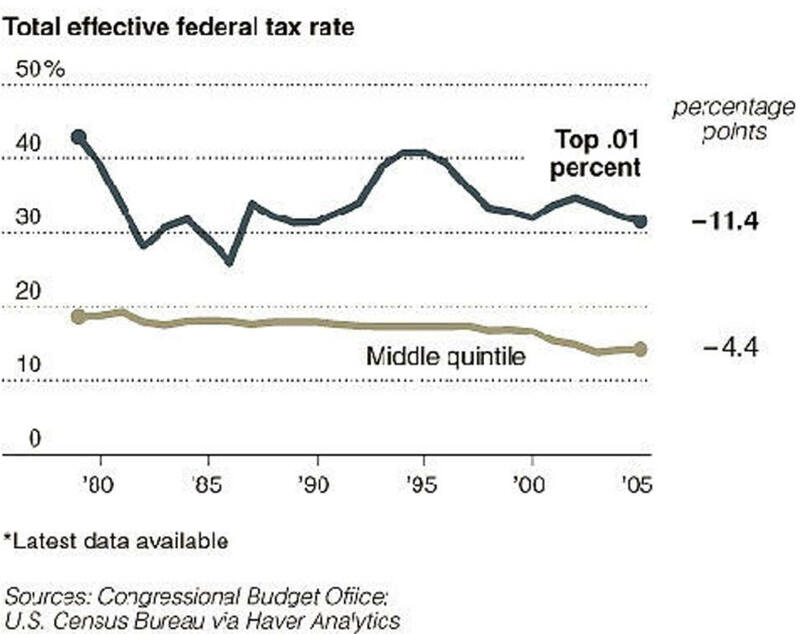 5% in 1960 to 13% in 1988, 22% in 1999 and 43% in 2005.
as this money could be used to solve many problems. 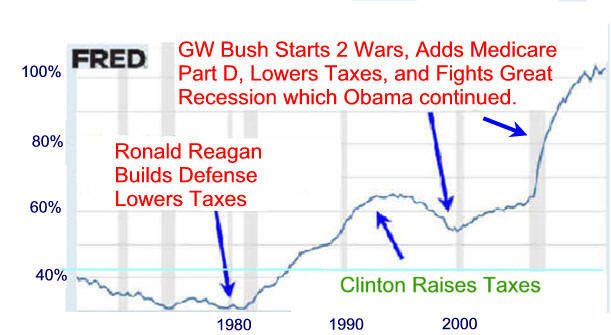 high federal deficits on interest rates. rates would increase, slowing economic growth. decision to dramatically curtail their U.S. investments. 1. 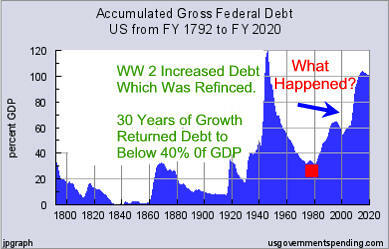 The debt was caused by wars and recessions. a. First-time homeowners go a few salary years into debt. these items are all expensed in the year of purchase. 3. Paying it would overtax the average American. money to solve problems rather than lower the deficit. a. This attitude changed substantially in the early 1990's. participants to make changes and balance the budget. Projection probably include an increase in current low rates. 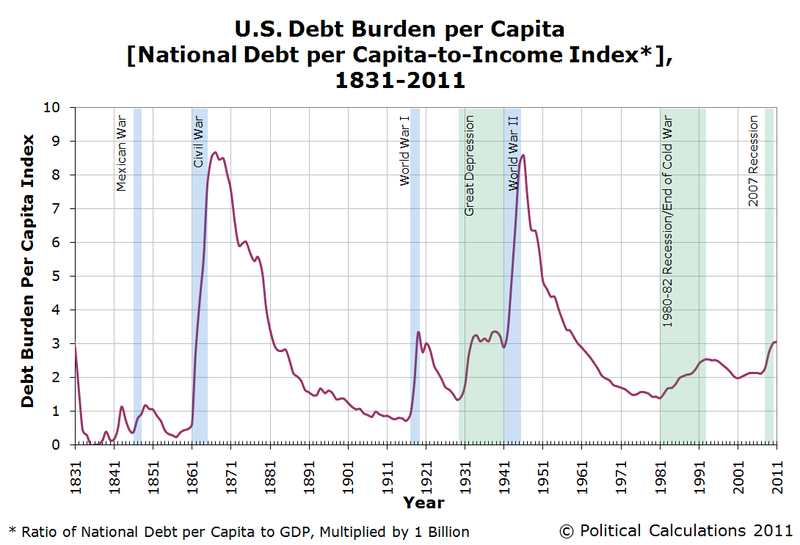 Editors Note: Revolutionary War debt had been piled up by both state and federal governments. Secretary of the Treasury Alexander Hamilton orchestrated the first federal tax on imports in 1789 to pay federal and state debt . 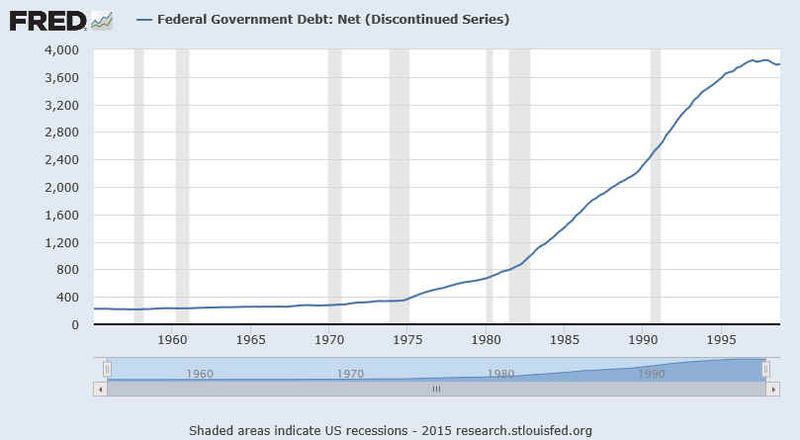 This debt was our largest federal debt related to GDP until 1933 when the Great Depression crushed revenue collections which caused deep- do-do (d-cubed). Secretary of the Treasury Alexander Hamilton began the practice of increasing taxes to pay for war expenses. 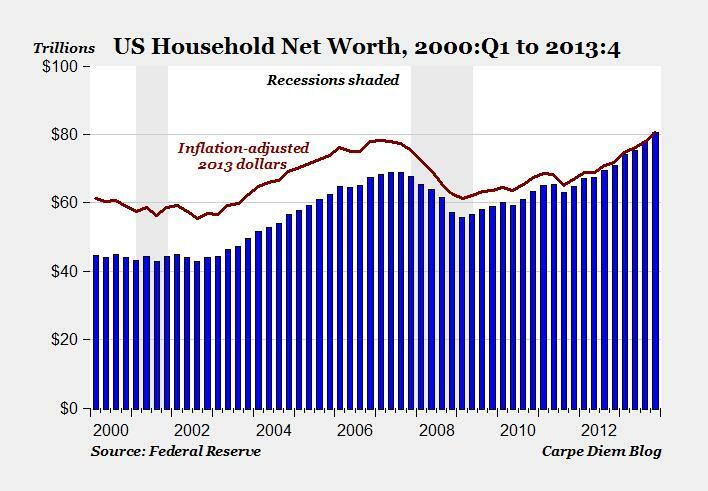 Printing money causing inflation usually helped. This practice continued for over 150 years. Then both Hover and Roosevelt borrowed not for war but to help people survive the Great Depression. 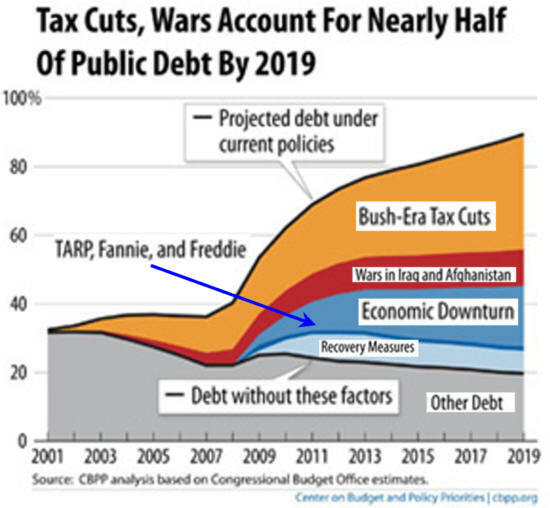 Then Bush II reversed over 200 years of logic as he cut taxes during good times so as not to pay for wars in Afghanistan and Iraq plus he created entitlement Medicare Part D.
Hamilton's paying state war debts began federal government practice. Today many states take the money and show their appreciation by telling the federal government to stay out of state and local business. Individuals also follow the practice of taking and saying stay out of my business. Retires and poor people don't want the FEDS involved with their lives even though much of our debt is caused by the big four of Social Security, Medicaid, Medicare and Defense. 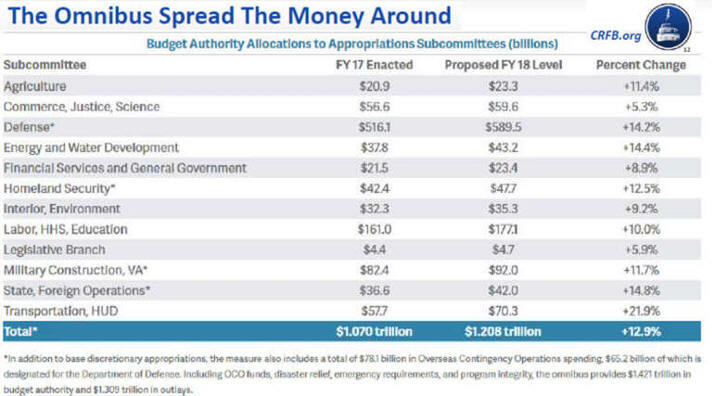 State and Local Governments can't print moneys so they can't have deficits. 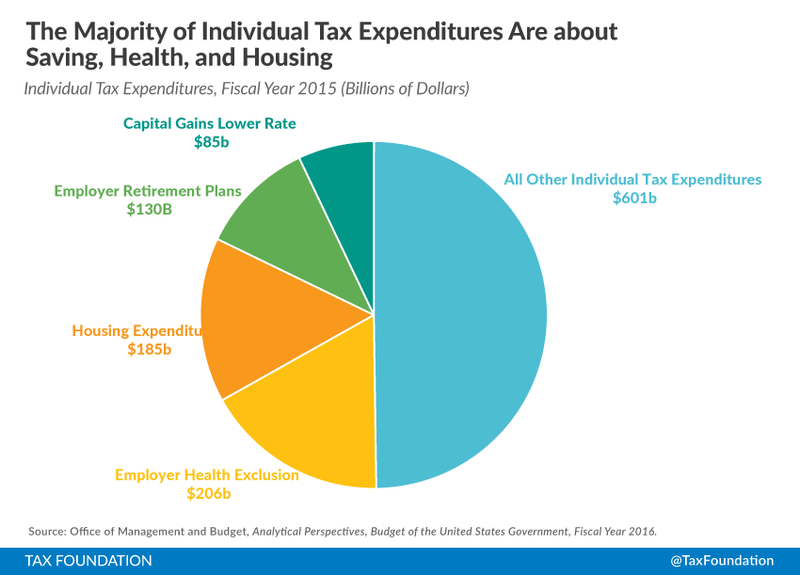 They use unfunded pension and health liabilities to cover future spending. Unfunded state and local employee and retiree benefits would head list of major contributors to state and local liabilities. I don't like the term entitlement programs when they are financed by individuals paying into a fund. This is especially true since there is not a contract so what the government gives it can take away so the word entitlements is a sham. V. Should America Be Unhappy With Her Federal Debt? But some were hurt by government financing with debt and inflation. 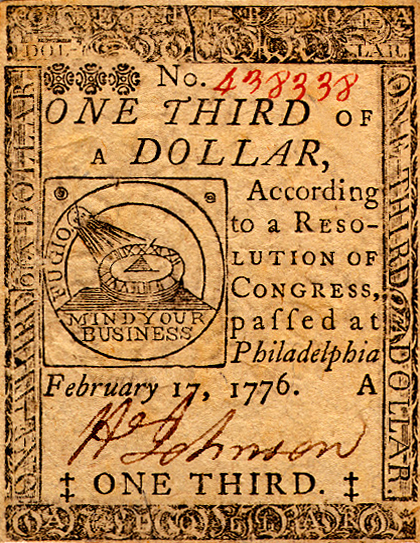 Revolutionary War veterans were paid in worthless currency which they sold at a large discount to wealth people who were then helped by Hamilton's decision to redeem at full value. This could happen again as debt is bought by the wealth on margin on borrowed money at low Federal Reserve sponsored interest rates. Some states had paid their revolutionary war debt and were not helped by Hamilton's decision to assume all war debts. Financial stress caused by financial excesses were substantial during the 19th century and early 20th century. Inflation during the 1970's hurt fixed income often retired older residents and fixed asset people. SS was not indexed to inflation until early 1980's. action and the debt has been much larger. 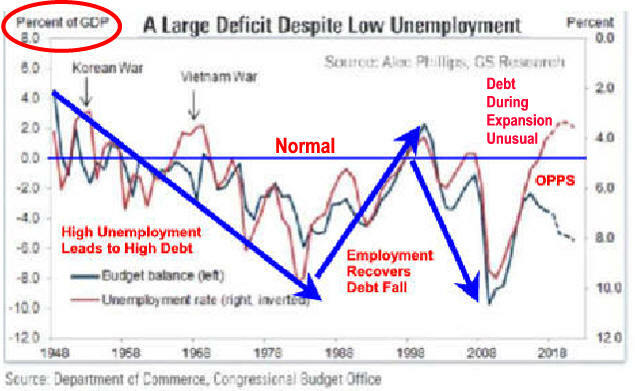 Economy Is Soaring, And Now So Is The Deficit. That�s A Bad Combination. In 1980, my friend Mr. Average lamented his Social Security pension would be small. He wished the government would take more out of his pay to increase his expected pension. This would be difficult as Social Security was having financial problems soon to be solved by a bipartisan commission chaired by a man named Greenspan. 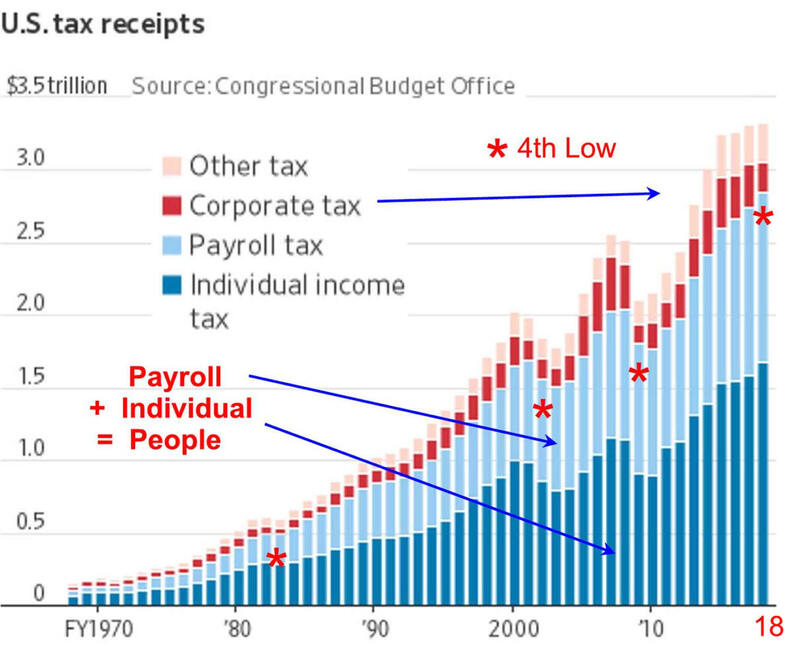 It recommended, Congress passed, and the President signed a social security tax increase, an increase in the wages subject to Social Security, and a delay in the normal retirement age. My friends normal retirement age increased from 65 to sixty-six. What have these changes accomplished over the past 25 years. 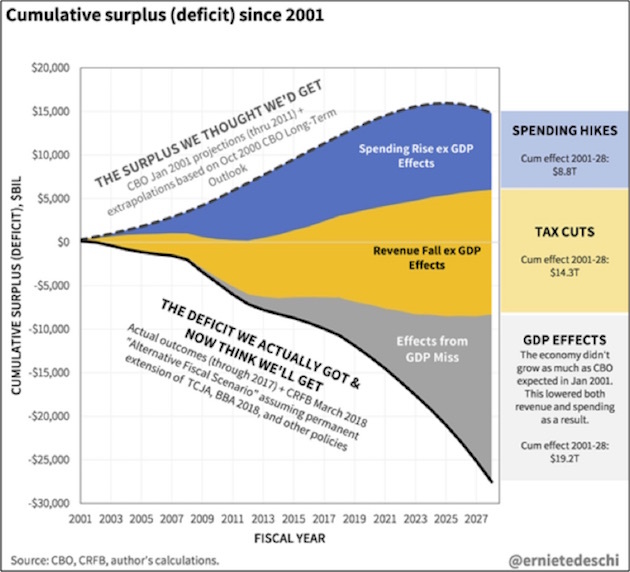 "Of course, Congress could always authorize the Treasury Department to authorize the Federal Reserve to monetize a certain amount of the Social Security and Medicare debt, which is essentially what Japan is doing (and seemingly getting away with it). I think we should all be grateful to the Japanese for being willing to undertake such a fascinating experiment in monetary and fiscal policy." Outlook for Short-Term SS Trust Fund Adequacy? 2013 Trustees Report measure short-range adequacy of OASI, DI, and HI Trust Funds by comparing fund asset reserves to projected costs for the ensuing year (the �trust fund ratio�). A trust fund ratio of 100 percent or more�that is, asset reserves at least equal to projected cost for the next year�is a good indicator of a fund�s short-range adequacy. That level of projected reserves for any year suggests that even if cost exceeds income, the trust fund reserves, combined with annual tax revenues, would be sufficient to pay full benefits for several years. 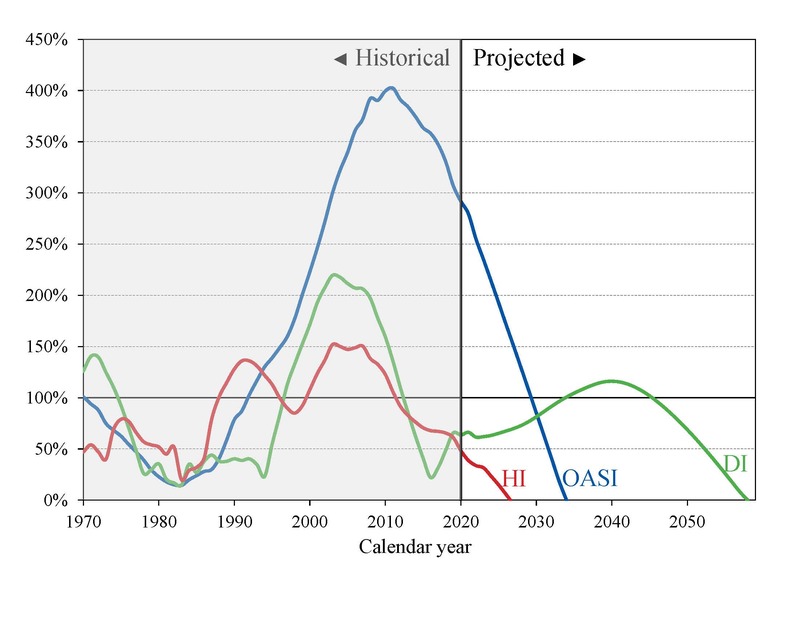 By this measure, the OASI Trust Fund is financially adequate throughout the 2013-22 period, but the DI Trust Fund fails the short- range test because its trust fund ratio was 85 percent at the beginning of 2013, with projected depletion of all reserves in 2016.
produce. Editors Note: What do you spend money on that is more important than retirement and health care? Current consumption, highway accidents, mental health of children, education, military safety, death and carnage from terrorism, death and carnage from lighting strikes? What to do! Options include increasing the wage base being taxed, the tax rate, and delaying the maximum benefit date. All were done in 1981. Ignoring the problem and borrowing the cash will be difficult as borrowing much more than we already have will push interest rates higher on Treasuries and lower the value of the dollar. So they will increase from $90,000 base soon because it is politically easier although Republicans won't be happy. Then a bipartisan commission will be formed to increase rates, wages subject to Social Security taxes, and the normal retirement age. A commission shares the political burden. All have been done before. What bothers me is a new option. Indexing Social Security to wages has caused Social Security pensions to increase. Wages go up because of inflation and productivity. A plan indexing pensions to inflation lowers pensions and a Presidential/Congressional cash crisis is avoided for a while. The Center for Retirement Research at Boston College analyzed this change. My friend Mr. Average just retired at 65 and receives $14,689. Had we indexed to inflation in 1951, the average Social Security pension would be lowered by $2,131 to $12,558. To be candid, my friend Mr. Average needs this additional income. Let us move ahead to 2025. Under the current system, Mr. Average will receive $16,205 in 2005 dollars, a $1,516 increase. If indexing to inflation passes Congress and is approved by the President, Mr. Average will receive only $14,689 in 2005 dollars. No real increase because he would not share in productivity increases. His pension would be larger in 2025 because it was but he could only buy the same amount of goods and services as in 2005. The Center for Retirement at Boston College also reports the entire mess can be solved by increasing the normal retirement age from 67 to 70 over a period of years for people under 45 or people under 55 could receive a benefit cut of 20%. Becoming Oldest-Old: Evidence from Historical US Data from MIT shows we are living longer. Since Social Security was adopted in 1935, life expectancy for someone 65 has increase by almost 5 years to almost 17 years. Since these numbers are going up, my friend Mr. Average is making out very well. My normal retirement age is 66 years. Hopefully I will pay for one more year and collect for 4 more years. Not bad! Boston College has more on Social Security. 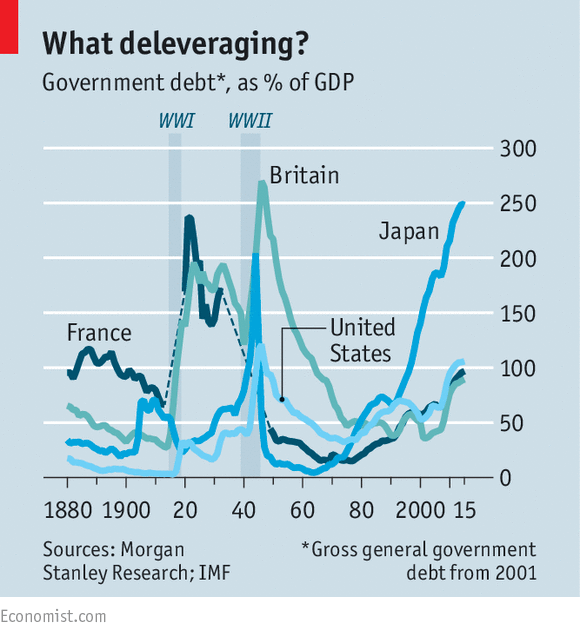 Many industrial countries have debt. Country 2003 Central Government Debt as a percent of GDP All are higher in 2015.
makes problem more difficult to solve. unless Obama Care works! Net Debt looks a little better.